Cremation vaults are made of concrete and may be lined with plastic. There may be decorative elements, tongue and groove seals, etc. 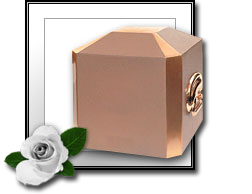 Designed with the same quality of manufacturing and construction as burial vaults, these smaller vaults incorporate all of the same protective principles as full size casket vaults, and are among the finest quality on the market today. These smaller vaults, designed with the same quality of manufacturing and construction as burial vaults, incorporate all of the same protective principles as full size casket vaults.